El Enemigo is produced in the foothills of the Andes Mountains at Piedemonte al Sur, of Luján de Cuyo, Mendoza. Winemaker, Alejandro Vigil, is also the Chief Winemaker at Bodega Catena Zapata and the former head of the soil division at Argentina’s Wine Institute. 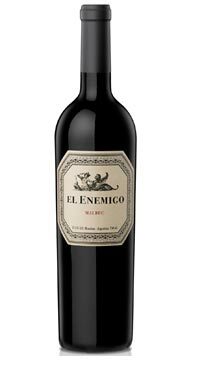 The El Enemigo Malbec is rich and concentrated with aromas of black fruit and cherries. The palate is full, spicy, fruity and floral. The finish is long and elegant.